Discussion in 'All Tanks / Factory Coils' started by yomajesty, Oct 27, 2018. I have a new Freemax Mesh Pro, and it won't stop leaking. It leaks mostly out of the air flow hole. It also gurgles a lot. Just after a fill, no matter how much I put in, it gurgles. When I lay the mod on its side, it also gurgles then leaks. If I stand up the mod (I have one of the FEW mods that can stand upright), it still gurgles then leaks. After a while, the gurgling stops, and I'll continue to keep it upright. Then, randomly, it'll start gurgling again. I've never had a tank that leaks like this. Any ideas? It's not a matter of screwing in the coil tightly enough. The problem has been happening on both the single mesh and double mesh coils it came with. May be an oring on the coils. I got some in the mail that we're crushed but the orings weren't even on there. Just laying in the package. I've got two that have never had any issues. What wattage you vaping the coils at. lak611 and Doomsday Vaper like this. I'm vaping between 50 and 70 watts, and mostly 60. Most time has been spent on the double mesh coil. I'm trying to inspect, and it looks like it has O-rings in the right places. Whatever's in there, it looks like the spares in the little baggie that came with the tank. Maybe there needs to be a second o-ring over the band that appears to be an o-ring? While looking for that, I had the tank upside down, with the drip tip off, while unscrewing it. Some juice dribbled out the drip tip hole. As for juice, I'm using a couple Valor Vapor flavors at 70% VG, so it's pretty thick. As for o-rings on the coils, I wouldn't know what to look for. Looking at the single mesh now, and there's something that looks like an o-ring. It's very tight, and kind of embedded deeply. Nothing removable or anything. I’m not sure. Only time I had a leak from one of mine was when it didn’t have the oring on. Or possibly the bottom or top seal at the glass is getting pinched when you put the glass back on after cleaning or when screwing the coil in. MannyScoot and MrMeowgi like this. MrMeowgi and Doomsday Vaper like this. Lol. Not an extra, It was installed in tank without. Funny it didn't leak either. Using the 2nd coil from package is when I noticed that they were all off of the coils in one fashion or another. That o ring is suppose to be down a bit more. In the grove below where it’s at. Right about the screw I groves is a little double lipped area. That’s where the ring should sit usually. Exactly. Was showing how the orings were running amok in package not in the intended position. I missed the first one, caught second, and will reinstall third in proper orientation . Brand new package of triples...same deal. I switched back to the single mesh coil and tightened everything up. When filling, I closed the airflow hole. Before and after filling, I took some dry puffs without the fire button. It's not leaking right now. I'm lying the mod and tank down to see if it leaks while horizontal. So far, pretty good. Within the next hour or so, I'll probably figure out whether most of the problem is a bad double mesh coil. The single mesh probably just had a different problem: the tank needing more TLC and tightening. I'm enjoying the tight draw on the single mesh anyway. It's not nearly as airy. Reminds me of my Nunchaku tank. That one has a great feel, but haven't captured a lot of flavor yet from it. And it's been leaking, too. It has a push in coil rather than a screw in, and the coil barely fits. It seems too loose. UPDATE: After a few minutes laying on its side, it leaked through the airflow hole. Yeah. The single is ok. They do have a SS single coil which is nice. It’s a good intro into tc if you ware looking to try that out without building first. I enjoy the triples the most for the flavor. I usually ran mine around 92.5 and got good life out of them. If I wanted lower wattage mesh I use the falcon. I run the mesh pro on my aegis legend and the falcon on the original aegis. View attachment 122788 Brand new package of triples...same deal. Gotcha. My bad on that. I found one fix. The tank came with a spare large o-ring for the top of the glass, and two small ones for the bottom. I took one of the small ones and placed it over the existing o-ring, hoping it'll create a better vacuum. It's not gurgling at all. If it's leaking at all, then it's only a little bit. It's been pretty much fine for the past 12 hours I've had the extra o-ring on. The strange thing is it now looks more like it does in images of the tank online. It may still have more of an indent to the bottom o-ring than the images. Is the bottom o-ring supposed to be doubled up? I installed a double mesh a few days ago. It still leaks, but not as much. Still doubling up the o-ring at the base of the glass, too. I think they might have assembled it with a wrong size o-ring. It doesn't look like the images online. It seems a bit thin, and so do the spares. One thing that will help, don't lay your tank on it's side. I don't lay it on its side. I have an RX200S, which has a nice tripod effect. Yesterday, I took the largest spare o-ring and put it over the existing base o-ring. Now it's only leaking slightly. I'd say screw it and get a Falcon, but people have major leaking problems with that one, too. Threading the top of the Falcon correctly solves a lot of cases, and so does skipping the mesh coil priming. However, plenty of people are still getting leaks. Maybe I'm just stuck smelling like phony maple syrup and waffles with the Freemax, or cheesecake and fruit punch. Do the coils you are using have 2 rubber O rings? I believe there should be one O ring above the threads, in the very top groove of the coils. This one sometimes ends up in the wrong part of the coil during shipping, and then 1 at the very bottom above the base plate for the coil. Also, I'm sure you are threading it correctly, but be sure not to cross thread. Yes. 2 o-rings each. The first double mesh probably just flooded too easily. Whatever the case, it was defective. I'm on the second double right now. It leaks, but it leaks less. Adding the big o-ring cut that in half. I get a puddle once in a while. Sometimes, there's random gurgling, and that happened a lot more with the first double mesh coil that came with the tank. Bubble glass slides right over top of both seals top and bottom. Love how that tank looks, I've got it in the same finish. Man I wish they came in a threaded top..I just switched to the original Fireluke tank after dumping 2 full tanks into my pocket after the sliding top opened up, lol. Unfortunately I didn't read enough to learn about the horrid drip tip setup on the original, otherwise would have settled for the Fireluke Pro in carbon fiber. There's a ring at the top of the glass. I added one to the bottom. If you mean the top of the chimney where the coil screws in, I can't see that area well. Not sure if there's one in the chimney. I did mean the thicker white ones on top and bottom of of glass. Oh yeah, your tank should have totally come in a seal at the bottom as well, that ones majorly important lol. I opened mine up and it also looks like there is 1 more ring where the top of the tank threads into the coil. Could be another spot to check. Yeah. On the tank itself, there was one thick one at the top of the glass and a super-thin one at the bottom. The spares were two thin and one thick. I left the thin one in because it's embedded rather deeply. I took the large spare and placed it over that, and that cut down the problem somewhat. At 60 watts, it looks like there may be some condensation. Sometimes the leak is a small puddle. Other times, it looks like a thin coating of liquid on the top of the mod. I'm having trouble seeing whether there is one where the top threads into the coil. The top is a slider. It's definitely an air vacuum problem. When it starts gurgling, I close the airflow and puff without firing it up. A few puffs fix the gurgling instantly. That prevents puddles. VallanceVape and Just Frank like this. I've had a black resin Mesh Pro for a few weeks now - I like the tank - the double and triple coils are great - but it has got some niggles....all noted in the forum...the O rings slipping off the coils - check, the top slide dumping juice in your pocket - check (I do have a good hack for this - use a wide vape band and place it around the base of the top - it looks a bit naff but it stops juicy pockets! I've had no leaking issues, so far....but I do have another issue - I have the 'goldfish' bowl glass on mine and the top O ring went 'floppy' - it droops down the side of the glass - see the pic. I took the glass off and the O ring was stretched so I swapped it out with the spare in the box....now this one has done the same thing!! Any ideas why this is happening and if there is anything to stop it?! I reckon getting more spares will be a ball-ache! Sorry for resurrecting an old-ish thread, but I've had this issue ever since I started with the Mesh Pro several months ago, and I'm desperately looking to solve it. I've used dozens of coils, from single to the recently-released quads, and even replaced the entire tank, yet still have this issue on a regular basis. Once it starts happening on a particular coil, it happens frequently, until I take the tank apart and rinse everything. This is just a temporary solution, as it seems that the leak continues internally very slowly until the pool grows too big to contain and comes out of the air intake. Doing a rinse delays leaking for a while, but it always starts up again. I know where the coil O-rings are supposed to go, and always roll them to their proper channel when they don't arrive in the right place (so that they're snug within the lower tank part when the coil is screwed down). I'd love to be using the larger fishbowl-style glass option, but I find the leaking is even worse when that one is installed. ....although, I am seeing this same complaint in lots of Google results. What are we doing wrong?? I've never seen the tip about the vacuum before. 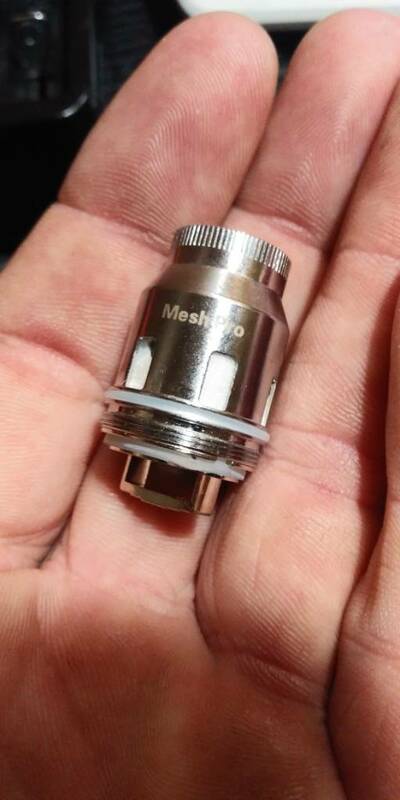 Does the Freemax Mesh Pro rely on a vacuum in the tank to keep the liquid contained? Do all tanks rely on that? I'm going to try yomajesty's pull-with-vent-closed method and see if that does something. Do all tanks rely on that? How can I view that link? I have a leaky Freemax Fireluke Mesh tank, but I get an error message that I don't have permission to view the link. If that's not the link you're talking about let us know which. Thank you. That is indeed what I was looking for. I'll try that on my tank. Sorry that you are having this problem particularly as it's happened with two different tanks - my 'floppy' O ring problem - see above - seems to have gone away....I am assuming it might have been the juice I was using?! This is one of my regular tanks and thankfully I have not had any serious leaking issues - you seem to be doing everything right - the closed vent dry pull is advisable for any tank, it helps prime the cotton and should prevent any leaking. One thing you could try - and whilst it is a bit of a faff - try taking the tank off the mod overnight and storing it upside down on the drip tip - I have never had to do this with the Mesh Pro but have done it with other tanks, notably the Smok TFV12 Prince - after a couple of nights sleeping on its head, the leaking did eventually stop. Good luck with it - keep going as the Mesh Pro is a brilliant tank. well i can attest that juice thickness is a factor in the mesh pro. Vacuum pulls ever fill also help in addition to keep the juice above the juice flow openings. check the orings both on the tank and in and around the coil. 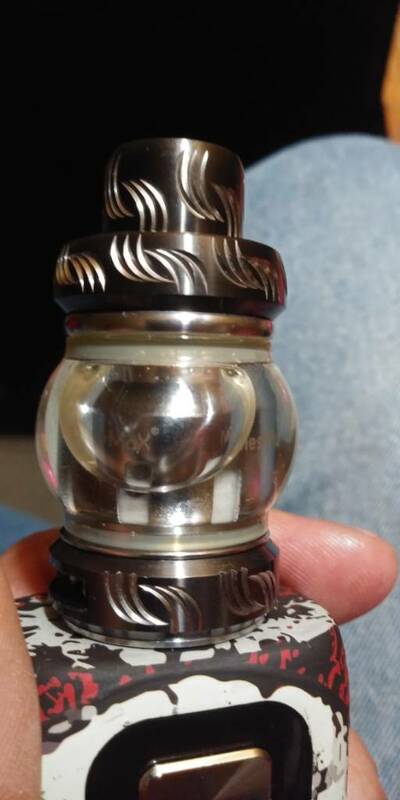 heck even plug the small vent fill hole could help some evn suggest using some cotton in the juice flow opening to slow down the wicking ... with mine it leaked day one and does not stop it also shares the easy to slide top thank god for thick vape bands. how ever the crown 4 no leaks yet. No go on the dry pull! Tried it over a kinda-24-hour period and leaks sometimes happen even within 20 minutes of a dry pull. I did switch to the fishbowl glass for this test though, as that one seems even more prone to leaks and I wanted to make sure whichever method I found was really really working. I think, since the fishbowl has more internal space, it's harder to maintain a vacuum in less confined spaces, so leaks happen more quickly. Next I'm going to try plugging the extra hole as you suggest above lordmage: The Mesh Pro's tiny air hole that gets exposed when you open to fill the tank. I'm not going to try adding cotton to the coil itself, at least not until I'm completely desperate; for now I'd like to spend some time on methods that might solve the issue rather than delay it, if that makes sense. I was getting almost no leaks on my Smok tanks and I just love the way the Freemax performs, way too much to go back, so I'm really really interested in figuring this out.